Just in time for Easter, and for World Read Aloud Aloud Day March 6, 2013, here's a suggestion for a delightful children's picture book. 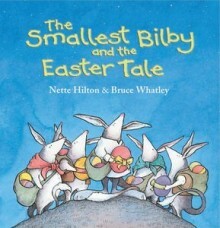 The Smallest Bilby and the Easter Tale was written by Nette Hilton, illustrated by Bruce Whatley and published by Working Title Press (Penguin), 2012. It's the third in a series that began with The Smallest Bilby and the Easter Star, and The Smallest Bilby and the Easter Games. It's the night before Easter and for the first time Billy and his band of little bilbies must deliver the eggs. 'This is fun,' they sing as they hide eggs here and there and up and down. But when one of the bilbies gets into trouble, only Billy knows what to do. Hilton has used simple but rich language in this children's picture book. It's a gentle but joyous tale, perfectly suited to its target audience of pre-school and up. I like the fact that though small, Billy must solve a problem and I think young readers will too. Bruce Whatley is one of my favourite illustrators. The art work in The Smallest Bilby and the Easter Tale is lovely - simple pen and ink wash drawings with soft colours. There are vignettes and whole page illustrations with some double page spreads, encouraging kids to visualise the story and see it from the perspective of different characters. Children will love identifying all the creative places the little bilbies leave their Easter eggs. The Smallest Bilby and the Easter Tale is a great story to start young kids thinking about the bilby and its link with environmental issues. It's also a good choice as a resource on Australian Animals. There are excellent Teacher Notes available at Working Title for the book. In Australia, many people promote the idea of an Easter Bilby rather than an Easter Rabbit. That's because rabbits have had a devastating effect on our ecosystem, and bilbies are an endangered species. You can buy chocolate bilbies as Easter treats. What a great pairing with The Smallest Bilby and the Easter Tale! I hope you'll consider giving this or another book at Easter even though International Book Giving Day is over for this year.